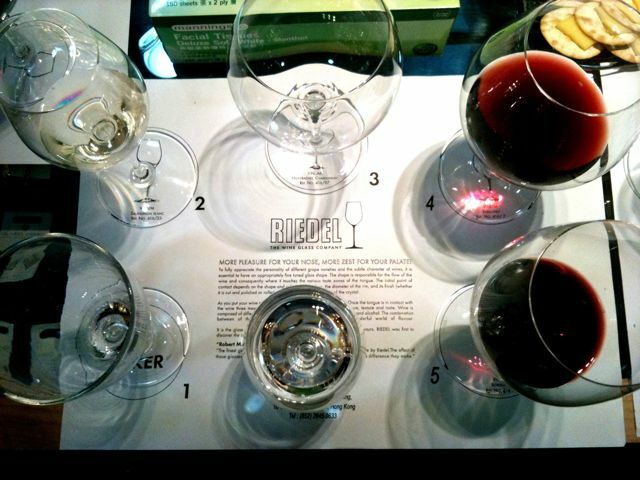 Is it a myth that the glass you sip from can greatly affect the degree of enjoyment you experience? I always wonder. I do experience factors affecting my enjoyment with the same bottle of wine though: ambiance, company, music, food and almost everything. It’s hard to judge. To my basic knowledge though, I do think the shape of glass do affect the breathing, aroma and the experience of drinking to a certain extend. TODAY, I finally got to test it out. Got an invite by Riedel to attend their glass tasting event so I took my friend Joyce along with me. Riedel has been making fine glassware since 1756 and has determined the characteristics in a glass that best enhance a beverage. Today was a series of tastings to learn the importance of shape and design of a glass. The idea is that the shape of the glass can affect its nose, and the shape of the bowl can impact where the wine lands on your palate when you drink it. 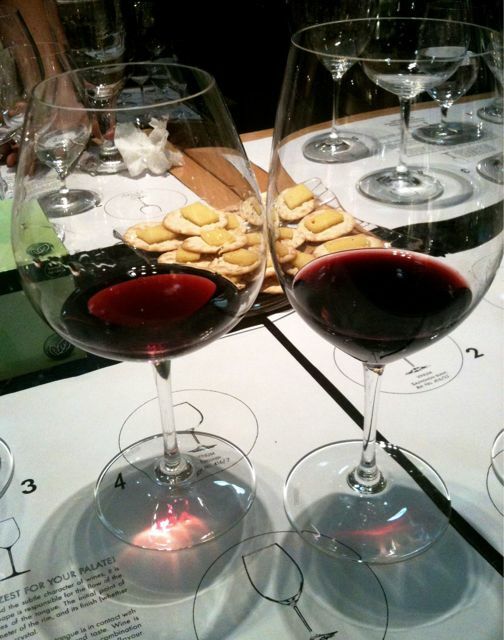 We tasted a variety of wines, including a Australia Sauvignon Blanc, a Burgundy Pinot Noir, and a Bordeaux red. All paired with the “right” glass from Riedel. First we used glass NO.2 which supposed to perfectly serve a Sauvignon Blanc to taste our Sauvignon Blanc. Nose was sweet, fruity, tasted crisp and fruity. The smell complimented the taste. 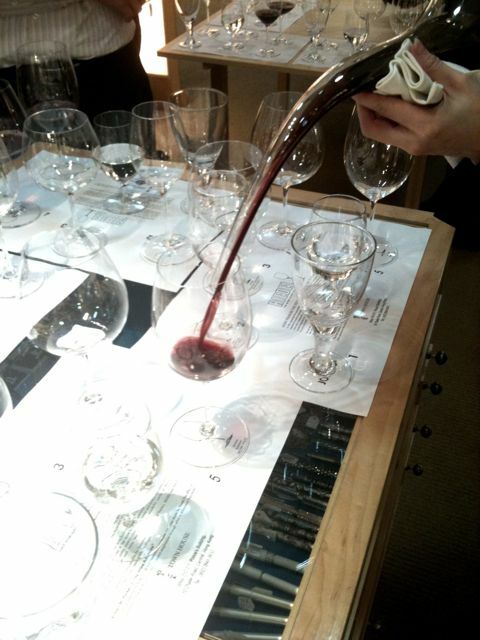 Then, we were told to pour the wine into a stubby “joker” glass No.1, and we tried the wine from it. We smelled something but the sweetness was gone. That something was perhaps just alcohol. It was slightly bitter back of my throat as well. It’s quite strange. Poured them back to the original glass and we tasted again. Damn! all the sweetness came back! No negative sensations at back of throat. I can assure you it’s quite excitingly spooky at the spot. Looked over across the room, the sommelier from Cépage just gave a nod so I hold back my scream. Next we tried the Pinot in the No. 4 Pinot glass. It was balanced, nothing jumps out, dominates others. The after taste was smooth. We were told to pour it to Glass No. 3, a near-identical Chardonnay glass, where the difference of the two glasses were just 1 cm cut lower with exactly the same bowl shape. All flavors were gone except it smells like preserved jam and higher acidity all of a sudden. You may conclude it’s probably because 80 percent of wine tasting happens through the nose and it affect our taste through it. However, I still find it well elusive. A 1 cm makes such great distance. Going to a restaurant, we sometimes BYOB but not our own glass. For the same bottle tasted perfect at home with our perfect glass, you may still blame the bottle if it taste less well at restaurant. Bottles always gets the blame. It’s funny. Choosing the right tools is important for having best enjoyment of wine like most things in life. Does it has to be Riedel? I am not sure, but it’s simple, easy and convenient just to go, pick one up and be sure I don’t waste any golden drop of any beautiful work. Pay 30euro (that’s how much the basic ones usually cost) to make a 200 euro bottle taste not like a 100euro one. 70 euro gain! not a bad deal right? But for budget table wine, why the hassle? However, if it can upgrade a 10euro bottle to 20euro one somehow (well, I guess you gotta try it out then! ), world can be magical and perfect! !